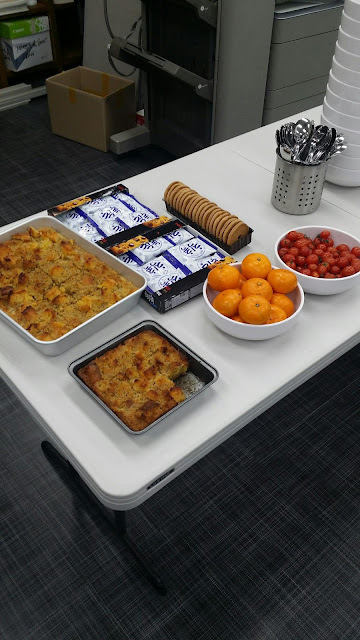 I got to the office about 50 minutes before I was to serve lunch to a mass of hungry coworkers. 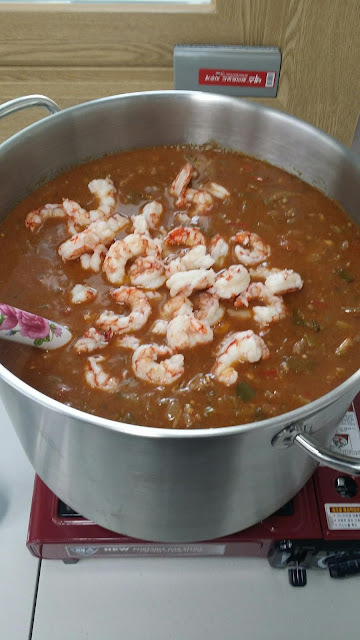 I set up my little gas ranges and decided that, since the shrimp was still frozen, I would quickly boil a small pot of water on one burner while I used the other burner to heat the massive amount of gumbo I had heaved into the office. This proved to be the correct strategy: by lunchtime, the gumbo still hadn't come to a boil, although it was plenty hot. Having boiled the shrimp on the side, I was able to toss the little guys straight into the gumbo (see above). Below: an exciting shot of rice and garbage. Next: the dessert spread. 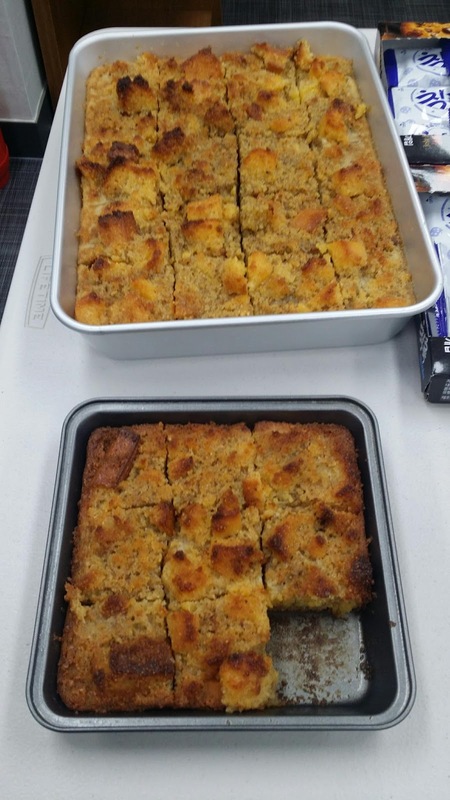 My coworkers bought fruit and cookies; I brought my bread pudding, which some people raved about. 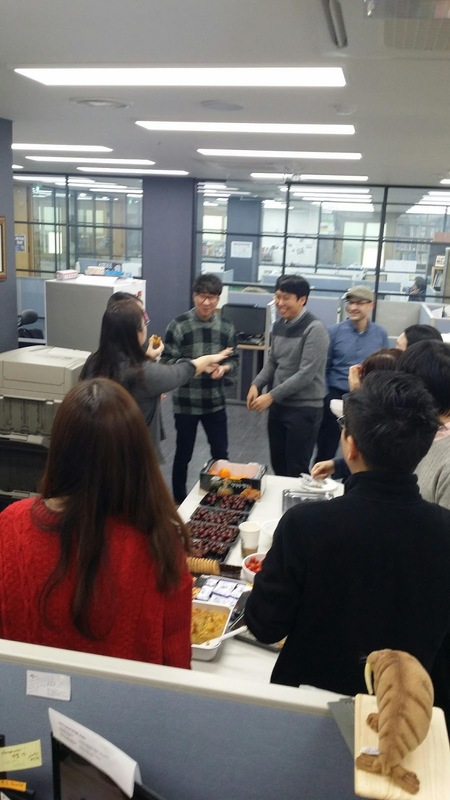 Lunch aftermath: some members of our R&D staff mingle with the IT team. The other teams ate and left. Koreans don't do the French thing and linger while eating: when Koreans want to linger, they normally go to a café to hang out, chat, and maybe smoke if smoking is allowed. Lower-right corner of the photo: my stuffed walrus. I also have a plastic octopus and squid, all bought at the Jamshil Lotte World Mall, where there's a shop close to the mall's aquarium that sells sealife-themed memorabilia and paraphernalia. Finally, a shot of my bowl of gumbo. 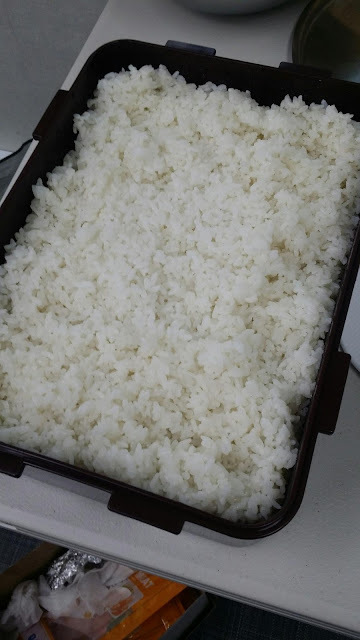 I did it wrong and put the rice down first. 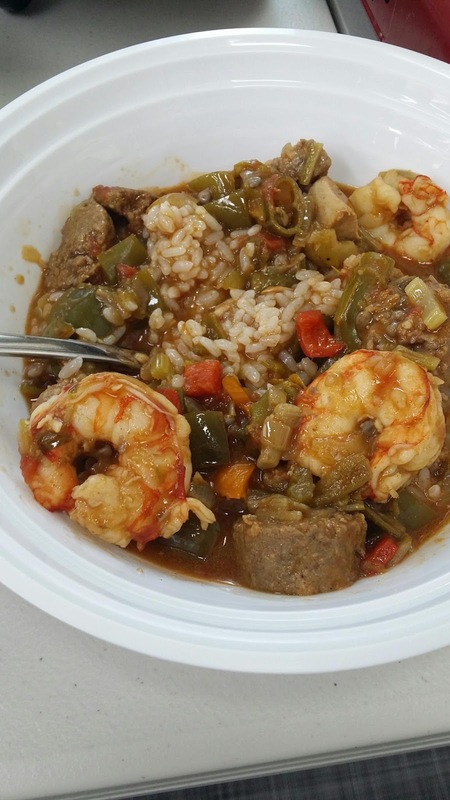 In Louisiana, rice is normally served as a dollop on top of the gumbo. One of the managers asked me all sorts of questions about Cajun cuisine; I answered with what little I knew. Another manager said this meal was better than the previous one (this guy is always making backhanded compliments; you're never sure if they're really compliments); I boxed up a load of gumbo for him to take home. Another coworker will be taking a load of gumbo and a few slices of bread pudding home to his fiancée. I had a hell of a time lugging everything to the office, so it's good to know I'll be going back with almost nothing. I might buy some more shrimp to throw into the remaining gumbo broth, and I'll toss in the rest of my andouille. As for chicken: I put in a whole two kilograms of dead birdage, so I really don't think I need to add any more. Thanks, John! Sorry for all the blurry photos. The only one that wasn't blurry was the final one, alas. Those Louisiana gals... they know a thing or two.